I played ASL153 Totsugeki! 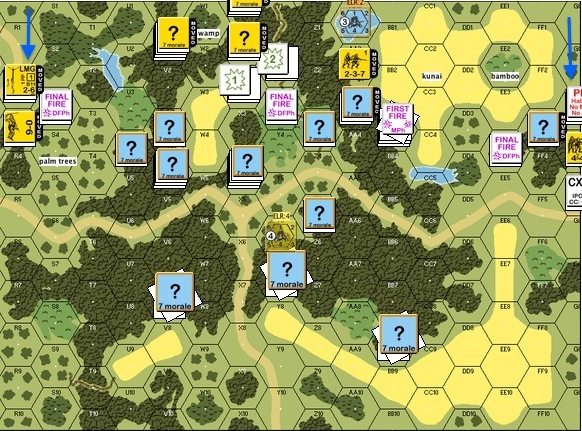 a while ago with Brian Y. I played a few PTO (Pacific Theatre of Operations) scenarios before but this is my first foray into full-blown jungle terrain. The usual Chinese vs Japanese (IJA) or Canadian vs Japanese scenarios occurred in China or Hong Kong, both of which are not in PTO terrain. ASL153 Totsugeki! however, took place in northern Burma. “Totsugeki” is Japanese for “Charge”. Chinese gunners, working with the Americans, were cut off in the jungle with fields of fire still uncleared. The IJA 55th Regiment pushed in and everyone in the 6th Field Artillery Battery found themselves fighting for their lives. IJA pushed in from the top of the map. There are three Chinese guns in specified hexes. 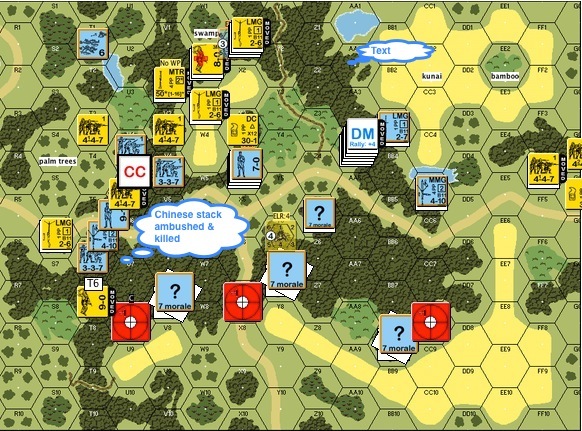 The Victory Conditions for the IJA is to eliminate or to capture all three Chinese guns and to occupy their hexes with good order crew/half squads/squads (“MMC” in ASL parlance) in 6.5 turns. The Chinese has 14 first liners vs the IJA’s 11 but they were understandably shaky (ELR 2). This is Japanese turn 1. The IJA wasted no time in rushing both flanks. They showed that the IJA squad will almost always get to where it wants to go. The jungle hindrance of course helped a great deal. End of Chinese Turn 1 : you can see the IJA was successful in turning both flanks. The Chinese 2 squads stack with the leader posed an issue though since it occupied a key position in the center of the map. 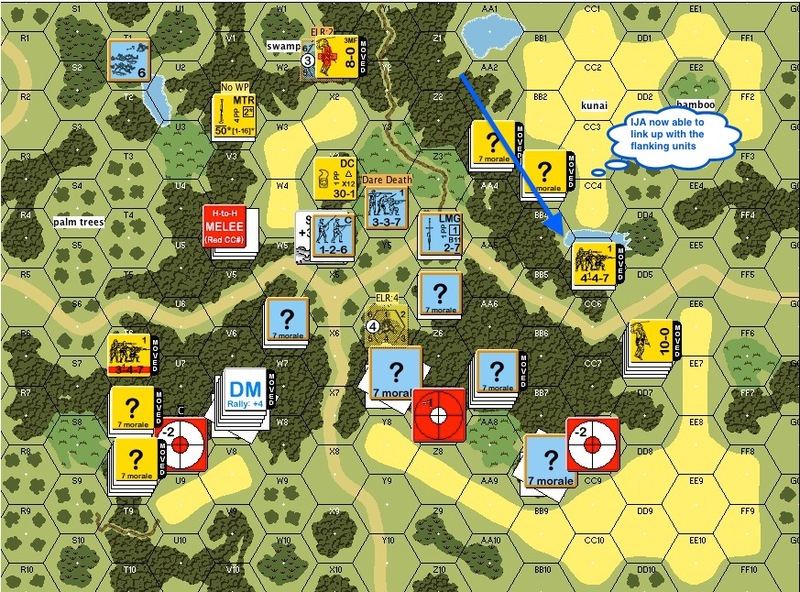 Approaching IJA units invariably got shot up. 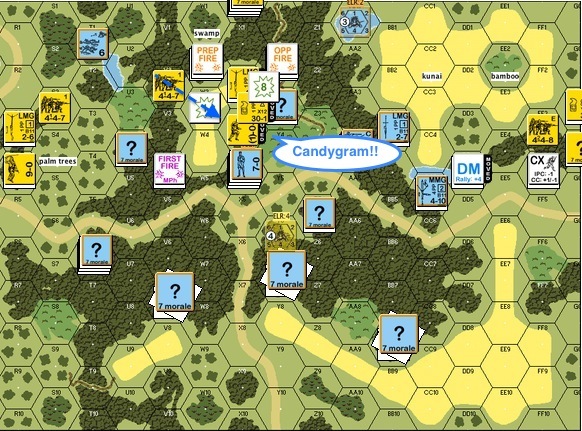 Japanese Turn 2: The IJA decide to get the party going with a DC Hero (“CANDYGRAM!! !”, a phrase favoured by one of my ASL mentors, Witchbottles). Unfortunately the Chinese weren’t ready to go wild yet and promptly shot the messenger. Japanese Turn 2 still : IJA forces slid down the left flanks, ambushed and killed the Chinese medium machine gun (MMG) team. This flank looked shaky but the Chinese held firm in the middle. That double squad Chinese stack in the middle were still chuckling over their DC hero kill. Japanese Turn 3 : The IJA was getting frustrated about not being to make much inroads in the centre and on the right flanks. On top of it, trotting through the jungle was a very slow going affair. So they decided to do a banzai attack! This is my first banzai attack in jungle terrain and I started to appreciate how well banzai attacks go together with jungles. It is got to be terrifying to have IJA troopers crashing out of the trees and falling into the ranks with bayonets and swords waving! 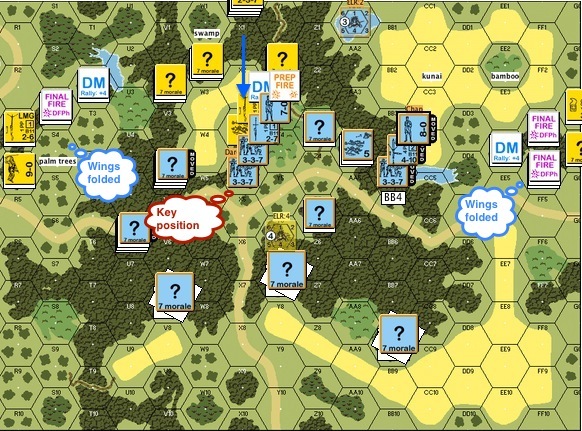 This charge allowed the IJA forces in the centre to link up with the right flank. 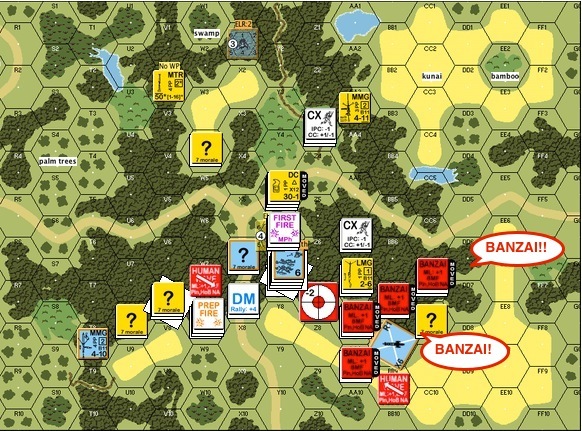 Japanese Turn 5 : The IJA spent turn 4 bringing the troops together for the final assault on the guns. 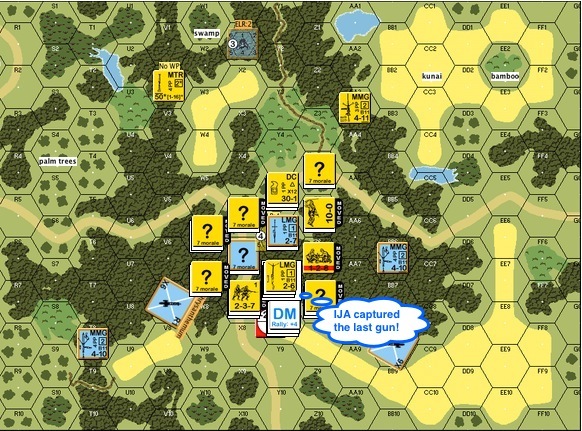 The IJA mass assault moved through the jungle. The two guns on the flanks fired pointblank at the incoming IJA and they both malfunctioned! 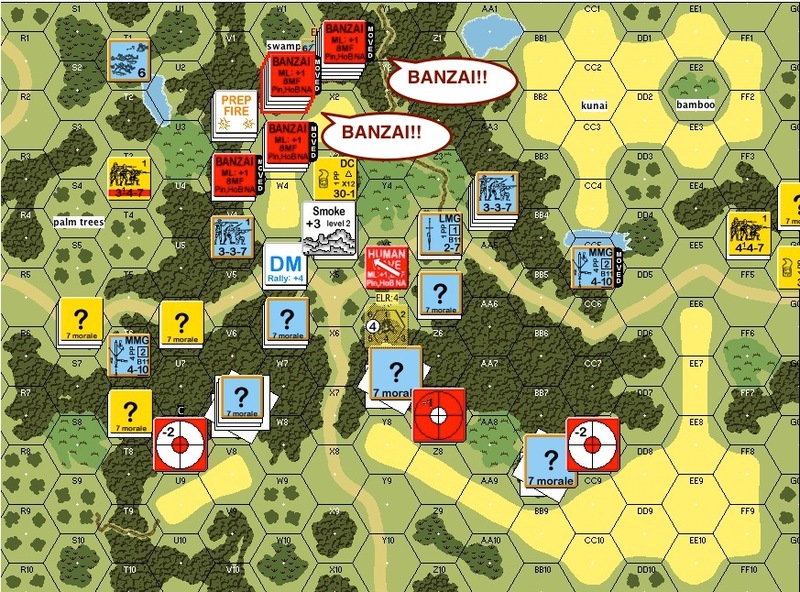 Japanese Turn 6: The IJA came into contact with the Chinese troops around the gun and one last banzai ensured! Sensing that the game was almost over, a DC hero decided to gave it another go. He too was shot before he could deliver the payload. On the other hand the last banzai piled a few IJAs into the last gun hex. The IJA captured the last Chinese gun and surrounded the defenders. Totsugeki is a great introduction for me to the PTO terrain. Going toward I’d very much like to explore the best ways for DC Heros to play together with Banzai’ers. I’d also like to commend Brian Y as a terrific ASL player. Thanks for a great game Brian! 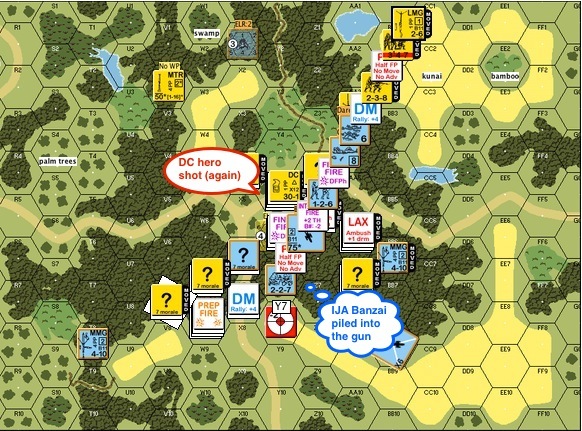 This entry was posted in Game Play and tagged AAR, Advanced Squad Leader, ASL, Board Game, Hong Kong, IJA, Multi-Man Publishing, Scenario, VASL, wargame. Bookmark the permalink. Nice AAR & attack! plus you used a lot more of the Japanese ‘tools’. Incidentally I did not think of cross linking AARS before so I might do that for ‘Point of the Sword’ – it helps people looking for specific scenarios get more info without searching. 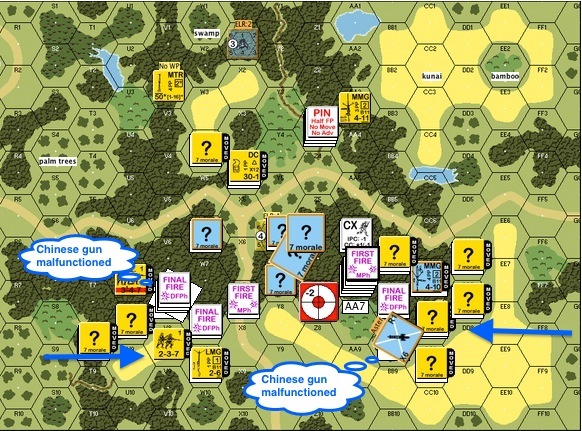 Also cheers for re-posting Eions bgg post – that deserves to not get lost in a forums back pages..
Hey Joss – great idea. I will go back and link up the scenarios we have in common. We seem to have similar taste in scenario choice! I am glad you enjoy Eoin’s piece. It’s really well done.